We are midway through Edmonton Design Week and still discovering some pretty impressive work from our design community. Check out these eight installations we don't want you to miss. Edmonton Design Week is a mix of free and paid events, installations, exhibitions, discussions, panels, talks and tours. Check out the schedule here! Whether you are walking, biking, or cruising this downtown tour will take you just over 3 kilometers of exploration. You'll see eight Edmonton Design Week installations, exhibits and events. Enterprise Square: Walk through time as you view five displays showing home design from the past 150 years of Canada’s history. Enterprise Square: Shin Matsunaga is one of Japan’s leading contemporary graphic designers, and this is the first major presentation of his design in Edmonton. Manulife Place: A collborative retail shop and gallery including goods from the General Concern furniture and home accessory collection alongside books and zines produced for the 2017 edition of the Hard Copy fair. Gibson Block: An installation of products available from Edmonton-based businesses and featured in Gifted, the inaugural gift catalogue from Edmonton Made. The Quarters. Fifteen interactive, illuminated see-saws (Impulse) and six giant zoetropes (Loop) will transform the Quarters into a space of urban play, filled with light and sound. 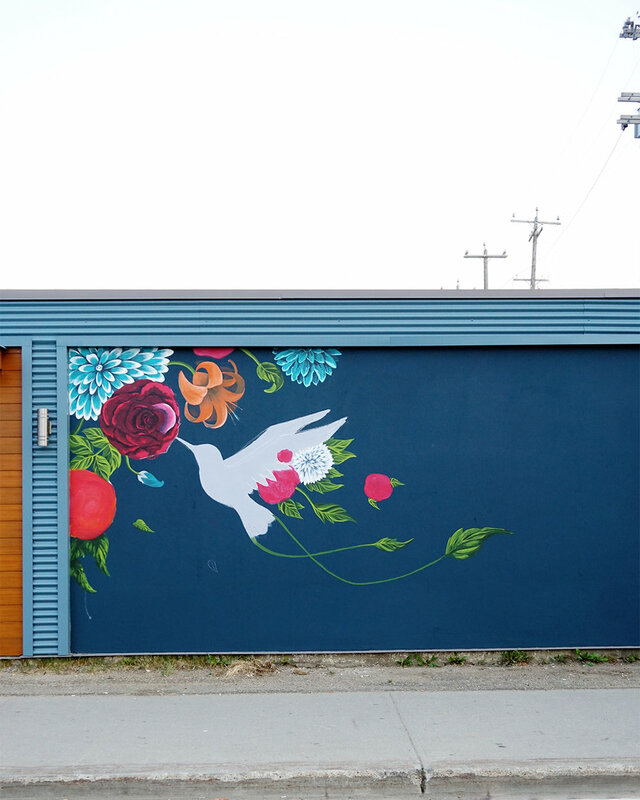 The Quarters: A colourful and playful art mural with the goal of evoking positive emotions. “Luz” means light in Spanish. City Centre Mall: Three large-format prints focus on pieces of debris found near Mirus’ studio – a tattered piece of plastic bag, a broken mirror and six-pack rings. We are 24 hours away from the start of the inaugural Edmonton Design Week, and we cannot wait to see what the incredibly talented designers in our city are bringing to the canvas! With so much learning and exploring going on over the next nine days, make sure you save energy to attend some parties! Edmonton Design Week has two official parties this year, the Launch Party hosted by Vignettes Design Showcase and the Wrap Up Party hosted by Crash Hotel. Below we have curated an amazing lineup of all the best parties to hit during EDW. Edmonton Design Week is a mix of free and paid events, installations, exhibitions, discussions, panels, talks and tours. Check out the full schedule here! “If we can get 10,000 people into the space it would be unbelievable. Well, that’s the goal!” says Leigh Wright, the creator of Vignettes Design Showcase, as he sits on the back of his pickup truck and stares at the old Edmonton Reuse Building across from City Hall. We were chatting months ago, as work was just beginning on the building to transform it into one of the signature events for the inaugural Edmonton Design Week. Mismatched paint covered the exterior that’s since been replaced with the word ‘VIGNETTES’ emblazoned across the front, while a Kristopher Kanaly street mural (put up during the Rust Magic festival this summer) adorns the east wall, and an original Giselle Dennis mural is now featured on the west wall. Inside, 14 teams of designers have been unleashed on three floors of the building at the corner of 100 Street and 103 Avenue, turning it into a gallery of design vignettes – eight-foot-by-eight-foot spaces that they were free to imagine in any way. Five interactive art installations of Canada 150-inspired landscapes have also gone in, along with a stylized pop-up dining restaurant and a retail store. Inside and out, it’s an entirely new building. But touring the empty, gutted space was also inspiring. “We were considering a lot of different spaces, but we want to use a space that’s on its last legs, to reactivate it. The Reuse Centre was the perfect space – square footage, accessible with parking, unused spaces,” says Leigh. It’s easy to see Leigh isn’t afraid of a challenge. Now in its fifth year, this year’s Vignettes is the biggest; Leigh is intent on reaching more people with the event. 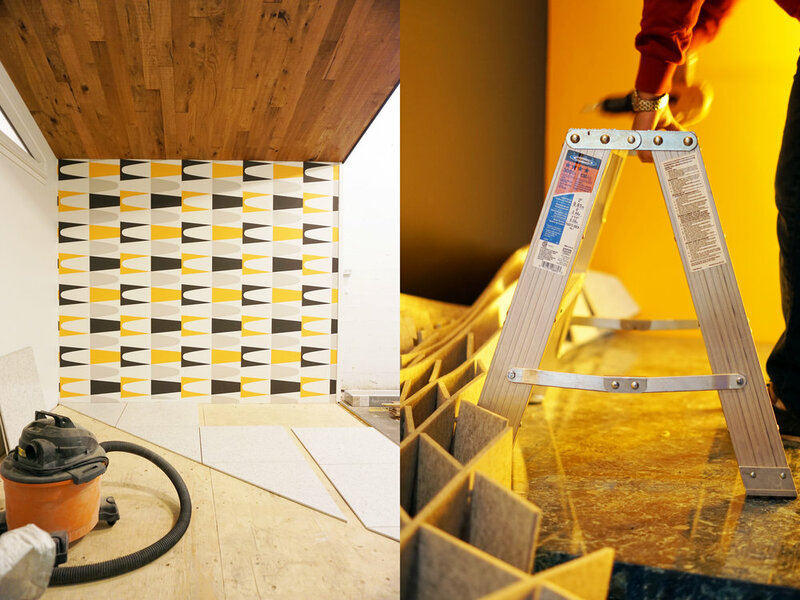 Without spoiling the surprise of Vignettes, we couldn’t resist sharing some behind the scenes of this incredible transformation. Be sure to see Vignettes in person, launching this Friday, Sept. 22 and running until Oct. 15. How was the concept for Vignettes created? It was born through travel as so many ideas are, I was so inspired on a trip to New York and I thought “why can’t these things happen in Edmonton?” So when I returned to Edmonton I launched the first iteration of Vignettes (in 2013). What can I say, I’m a yes guy! What is your all-time favourite vignette? They’re all so amazing and creative in their own way, but if I have to choose. … Years ago (when Vignettes was held at the Sugar Swing Ballroom in Old Strathcona), there was a Bluegrass themed vignette with a live band playing inside of it, and last year I loved the Bunkhouse, it could actually be used in a home, which was so cool to see. Also, there was a whiskey briar patch with finishes on it that were impeccably executed, and of course both winners were obvious showstoppers. What inspires you about Edmonton, specifically as a designer? We have an amazing design community and so much work coming out of our city that we should be proud of. Yet, locally it’s been hard to get people excited about design. It will be great seeing how Edmonton Design Week and Vignettes help grow that passion and awareness. It’s also important to give a shout-out to our community; it’s so tight knit and everyone believes in what they’re doing and is willing to lend a hand. The whole shop local, buy local, support local movement is truly what makes this city flourish. Long term, where do you see Vignettes? At our first few events we had 100 people come through and at the time, that was a huge success; last year Vignettes lasted over two weekends and close to 5,000 people came out. Ultimately, we hope every year that that momentum and awareness keeps growing. For Edmonton as a design community, I want people to come from all over the world and see this glimmer of hope that we are a design city, that we are focused on and have put the time and energy into becoming a hub for design. That’s where I want to see our show go and our city go! Vignettes will be hosting Edmonton Design Week’s official Launch Party on Friday, Sept. 22, from 4-11 pm. Everyone is invited; get your tickets here! Only four more days until Edmonton Design Week officially kicks off, with Vignettes Design Series hosting the Official Launch Party this Friday. Join us for a night of design, live art and music - and of course amazing cocktails! Everyone is invited, so to ensure your spot at the party snag your ticket here. If you can't make it to the launch, no problem. Edmonton Design Week offers 42 installations, exhibits and events running over nine days, giving you tons of time to explore them all. If you are into exploring new spaces as much as we are, check out the list we've compiled of must-see projects in unique spaces. We want to help you make the most out of Edmonton Design Week, no matter what discipline you fancy, there is something for everyone. Check out the six projects we've identified below that certainly have us learning a thing or two! Just off 99th Street, near the Argyll industrial area of Edmonton, sits Timbre, a hub for 13 creative start-up companies. 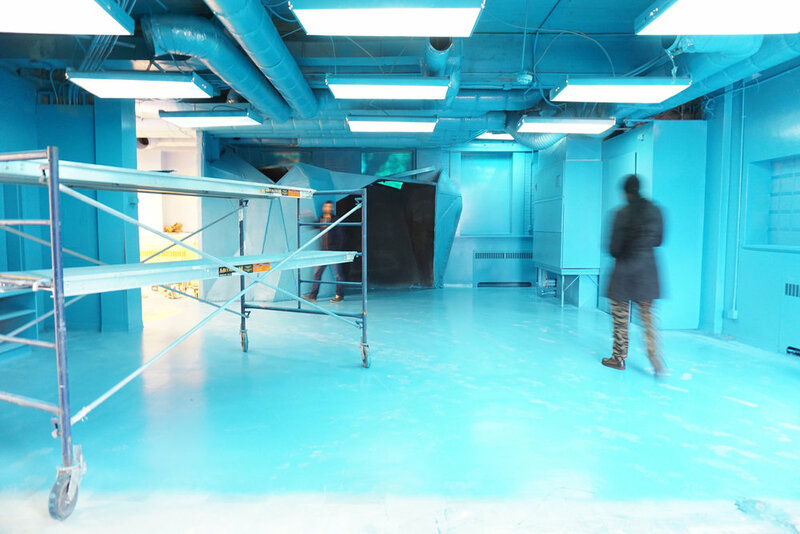 Designed with creative endeavours in mind, Timbre is separated into a fabrication workshop, a pod of a dozen studios, and a gallery. Founded in 2015 by Mike Lam and Jordan Tomnuk, Timbre has a mandate to foster the creative community by renting both office space and studio space to burgeoning companies and makers. We spent the day at Timbre, chatting with Mike and taking in the energy and ambition of this space nestled away in the South side of Edmonton. How did Timbre transition into a hub for creatives? When I bought the space in 1999 I was working as a designer in the plastic business and during that time I started to acquire woodworking machinery. I thought, maybe I should start making furniture, but having acquired so much equipment, I also contemplated opening up the studio and sharing the machinery with other industrial designers and woodworkers. That way everyone could benefit! I wanted recent graduates to have a collective community because we’re herd people. It can be very difficult after graduation – running a business, purchasing equipment, living in a basement to cut costs, etc. and that can make it impossible to function. Yet if we have a collective voice, we can encourage each other to be more creative and that’s not something that happens everywhere. So, Jordan became one of the first renters for the space and through his connections we were able to rent it out to many other talented designers. What was the process for designing Timbre? Trying to design space for different designers is a bit challenging because by nature we're quite critical. One of the challenges, from a design perspective, was to try to understand how designers work. Personally, I have a data collection process or an emotional data collection process in a public space, then, I bring the data back into my private space and try to process it. So, it's a process of having access to the outside and then the privacy of my own space. The Timbre studios reflect those two worlds. For the public space, I tried to make it as inviting as possible with skylights, huge ceilings, and a bit of an industrial feel. I spent six months shopping in the Architectural Clearing House and one day I was lucky enough to buy these big windows and doors that determined the actual space in each studio. Having these big windows and doors means the designers don’t get stuck just hiding in their studios. It encourages physical interaction and the organic interaction between designers, and it ultimately has a positive effect on their design. How does the design of Timbre relate to the mandate of your design process? Emotional reward is a primary drive of what I do. Form meets emotion. But in this instance, I'm dealing with designers who are creative and alive, I’m no longer dealing with materials and numbers. I'm dealing with people, creative members who have their own identity and that has been so exciting for me. Timbre has about 30 designers coming in. They all have different backgrounds and they all have their stories. Their talent and how they love to evolve in the design community is amazing — I’m very lucky to be a part of this group. They make Timbre alive and meaningful. I don't know where we're going to go from here, but I know what’s coming will be interesting! Armed with the luxury of time thanks to a sabbatical from his day job as an associate professor of industrial design at the University of Alberta, Tim Antoniuk has been working seven days a week determining how people can live more sustainably – and, even more importantly, happily in small spaces. The result? Antoniuk has built a completely livable 230 square-foot micro condo. The desire to eschew traditional picket fence living for smaller homes has been growing; Antoniuk has seen this shift in mindset, first globally and now, increasingly, locally. Antoniuk, who will be participating in Edmonton Design Week Sept. 22-30, 2017, took the time to answer some questions about the importance of design in his work. What is the biggest challenge when people consider downsizing? The biggest hurdle is just the idea of it – it’s hard to envision and so that’s why I developed the Micro Habitation Lab. I wanted to test my ideas, to test the flow of a small space, and explore how people use and integrate with their environment. What’s your thought process when you begin designing micro-homes? For me when designing, everything starts with the people. It’s not about what I think or want in a space; functionality is driven by what the end user wants and needs. It’s about the meeting of soft tissue (the human elements) and hard tissue (the manufactured elements). In the Micro Habitation Lab, I worked on how to maintain storage, how to preserve sleek contemporary design, and how a person could seamlessly transition the space for various needs. There needed to be a blurring of product and space to capitalize on every square inch, which required integrating as much as possible directly into the interior architecture. If all your design work is created with a client-first mentality, who is the Micro-Habitation Lab for? This space was designed for people who are looking to live sustainably with less impact on the environment in a high-density urban environment, those in search of a humble life that no longer requires a huge house. Do you have a favourite feature in the lab? If I absolutely have to pick it’s the moving wall unit that functions as a bathroom wall, and also as storage. When I started designing the space, I simply couldn’t build a tradition bathroom without impacting the rest of the space, so I replaced a static wall with a moveable wall unit. Movability is so important in small spaces and yet it’s typically not a design choice. Any final thoughts on the future of design? Developers will reach a point when there’s too much of the same. Everything is lovely, but there’s no focus on what people really want, and design for the masses isn’t the solution; tailored design for specific people is. The deeper you look and understand people, the better design can be. Who is organizing this festival? EEDC’s Downtown Vibrancy Program is helping to lead the inaugural Edmonton Design Week, with significant help from the community. We helped bring together 10 individuals from different disciplines across the city’s design community to form a working group to plan and execute the festival. Together, we created the concept of a week of community-driven design events anchored by Vignettes. So, while we are bringing everyone together as part of the festival, all of the events and activities are being individually organized, so they will really reflect the interests and expertise of our local designers. We asked Moirae to answer some more questions about how it all happened, and why the festival is important to Edmonton. Last year, we were working with Leigh Wright from Mojo Design on another project and casually mentioned he had been coordinating Vignettes Design Series. At the time, they were in their third year, showcasing in a church hall off Whyte Avenue. They would put a callout to artists, designers, woodworkers, you name it and they would apply to design 8’x8’ spaces in teams. Vignettes had a couple hundred people going through and we thought it was such a cool program; we wanted to help them scale it up. We helped them secure the former Sobeys space on 104 Street, brought them downtown and pitched them to add a culinary component. We saw such a success from that, and the event grew to having over 5000 people go through. Vignettes really brought to light the amount of space and opportunity for design in Edmonton, and the question we asked ourselves was how could we create design across multiple disciplines. And that’s where the idea of an Edmonton Design Week came from! Do you think people associate design with Edmonton? I think we’re beginning to see that more and more as Edmonton evolves as a whole, and a lot of different industries keep growing. We can see this through the design awards the pavilions have won in the City of Edmonton parks. A lot of the architecture firms are coming to the forefront and independent designers in general are working to expose design in Edmonton. Even down to the universities and what their students are doing, such as The University of Alberta’s Student Design Association and their recent “Built” pop-up in December at Kingsway Garden Mall, which was a temporary store of locally designed products. There are more pop-ups, events and media opportunities surrounding design that result in design reaching people who might not necessarily know about it or be interested in it because they just aren’t aware of it. Do you think there is anything about Edmonton that inspires design, or makes it a place that sparks so many new ideas? Edmonton is definitely a city for entrepreneurs. Everybody is willing to help and build each other up, whether you need an introduction to somebody, or simply help building a program or event. At EEDC, we are really involved with our entrepreneur programs like Startup Edmonton, TEC Edmonton and Edmonton Made, as well as our community activations efforts. There’s so many programs that want to help build these programs and these people all to be able to create what they are good at, so I think that makes it a little bit easier to climb that ladder, be exposed to a larger audience and do what you really love in Edmonton, because of the support. Who is Edmonton Design Week for? Everyone. Design is for the masses and when we say that on the website, we mean it. There’s no too young or too old - if you’re five and you’re interested in design that’s great, we want to give you something in Edmonton to see and get excited about. If you’re 80 and you’re interested in what’s happening downtown, or design or a specific discipline we want to make it accessible and to ensure you have a good time. For me, I think it’s all about building community, a strong community. I think that’s super important, merging the design crowd to attendees, allowing those two groups to flow together and build on that community. That’s why this project is important to me because I'm able to help create something like that. So then to build that community, how do people get involved in Design Week? If you have work you want to showcase, we want to hear from you. We want this to be your city to showcase in so whatever we can do to help bring that to fruition, we’ll do. If you can attend in September, come out, learn about local design and follow along on social media. We want this to be a conversation and a meeting of worlds and to do that, we need you!